Veteran trade unionist and politician Seyed Ahmed Seyed Alavi Moulana passed away on Wednesday 15 June 2016 during the holy month of Ramadan. His funeral took place at the Dehiwala Burial Ground the following day. “Moulana had been a decent man with malice to none. He was gifted with the best of negotiating skills. With his pleasing manners, humour and the policy of middle path he amicably solved disputes that made both workers and management alike like him”. Moulana was one of the first Muslims to join the Sri Lanka Freedom Party in 1956 when the island’s Muslim community was identified with the United National Party. He remained with the party till his last moment – a rare trait in the island’s politics today when the norm is for politicians without principles to switch their loyalties for perks and positions. Be it during times of prosperity or adversity, Moulana continued to defend the rights of workers. During the time of late President J.R.Jaywardene who crushed trade union movements to promote his open economic policy, Moulana had to face numerous problems. He was attacked and severely wounded. He showed me the wounds he suffered from his hip to upper rib when he was attacked by bicycle-chain-wielding thugs. Those were difficult days when he had to face financial crisis too. However he didn’t turn to anyone for help but managed with what he could make. He did not try to join the UNP to tide over his difficulties. 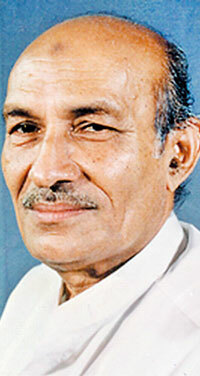 After Anura Bandaranaike crossed over to the UNP, I asked him whether he would follow suit. His response was, “My loyalty always remains with SLFP and the Bandaranaike family in prosperity or adversity”. As we know here in Sri Lanka political fortunes change fast. After 17 years of UNP rule, the SLFP came to power and his patience paid off. Born in 1930, he entered municipal politics, early in life in 1948. In 1960, during Prime Minister Sirimavo Bandaranaike’s period he was made the SLFP’s trade union leader. He was later appointed one of the vice-presidents of the SLFP and the senior vice-president of the Sri Lanka Nidahas Sevaka Sangamaya. He also served as Deputy Media Minister, Provincial Councils and Local Government Minister, labour Minister and Acting Sabragamuwa Governor before he retired as Western Province Governor. He was also adviser on Muslim Affairs to former president Chandrika Kumaratunga. On his 80th birthday he was conferred the title of “Jana Prasadiu” by the then President Mahinda Rajapaksa. He was a founder of Sri Lanka Committee for Solidarity with Palestinian People and played a crucial role in championing the rights of the Palestinians and exposing Israeli atrocities. As a devout Muslim he played a prominent role in trying to sort out the problems the community faced. He was seen at every function and everybody liked him.